Undefended Heart is well served by Board Members with extensive backgrounds in nonprofit service and leadership, and industry expertise in education, health and business. Joan has extensive experience in teaching and community leadership with an emphasis on empowering people through education. She is the Chair of the Math department at the Waring School in Beverly, Massachusetts. In addition, she is founder of a program that provides educational enrichment in math and science to elementary school children and their families. She earned her BA in Mathematics at the College of the Holy Cross and her Masters of Science in Teaching at Boston College. Over the past 20 years, Joan has taught mathematics at both the secondary and college levels. 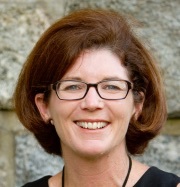 In addition to her work and family commitments, Joan currently serves on the Board of Trustees of the Pingree School in Hamilton, Massachusetts, where she is Chair of its Education and Identity Committee and past Chair of its Strategic Planning Steering Committee. She is a also past Chair of the Board of Notre Dame Mission Volunteers, a national non-profit organization and AmeriCorps partner that places 400+ full-time volunteers in low-income communities to promote literacy and education. Joan performed two years of full-time service as a member of the Jesuit Volunteer Corps early in her career. Julie is a Physical Therapist and since 2001 she has served as CEO of Integrated Rehabilitation Services, a physical therapy practice with nine locations throughout Connecticut. She has received the Hartford Courant “Top Workplace Leader Award” on two different occasions, and is the only person to receive that honor twice. In 2011, Julie earned the Tolland County Chamber of Commerce Economic Development Award in recognition of business growth in the community. Julie earned a BS and Advanced Master's in Orthopedic Physical Therapy from Quinnipiac College. Since 1995, she has worked closely with Brian Mulligan, with his manual techniques of “Mobilizations with Movement,” and was the first woman in North America certified by the Mulligan Concept Teacher’s Association to teach his manual physical therapy concepts internationally. Julie is an active volunteer, having served in the past on the Board of Directors for the Notre Dame Mission Volunteer program and as President of the Tolland County Chamber of Commerce Board of Directors. Mark is a Certified Financial Planner, earning his CFP® designation in 1992. He is the principal and owner of Integrated Financial Strategies. Mark has served on the Board of Directors of several non-profit organizations, including Seven Peaks School in Bend, Oregon. He served as Board Chair of the Notre Dame Mission Volunteer program from 1991 - 1999, providing instrumental leadership as the organization transitioned into partnership with the AmeriCorps program. Mark was also one of the first nonprofit directors for Bend Experimental Art Theatre (BEAT) in Bend, Oregon, and helped to launch that innovative community theatre program. He earned a BA in Psychology from Duke University in 1983 and an MBA from the University of Michigan in 1988. Mark holds FINRA Series 7, Series 24, and Series 6 & 63 Securities Licenses.